Shahu was the son of Chatrapati Sambhaji Maharaj and his queen, Yesubai. As such, he was the grandson of the great Chatrapati Shivaji Maharaj. Aurangzeb had wanted to convert Shahu to Islam, but on the request of his daughter, Zinatunnisa, he instead agreed to accept Khanderao Gujar, a son of Prataprao Gujar, as a convert. 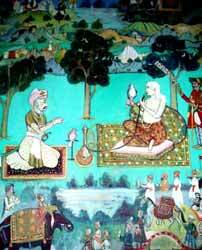 It is said that it was Aurangzeb who named the child Sahu, 'the good one'. It later changed to Shahu and was taken on permanently by the king. After the death of Aurangzeb in 1707, Shahu was released (18 May 1707) by his son, Prince Azam, at the advice of his commander, Zulfikar Khan. Prince Azam gave Shahu the royal insignia, Maratha guards and an entourage (which notably included Mahadji Krishna Joshi and Gadadhar Pralhad Nasikkar), and also sardeshmukhi (revenue collection) rights over six Deccan subahs along with Gujrat, Gondwana and Tanjore. Shahu collected a small army on the way and arms from a chieftain at Bijagad, Mohan Singh Rawal. The idea was that it should prove to be a goodwill gesture towards the Marathas and perhaps also create a succession war in the Maratha camp. Predictably the dowager queen, Tarabai, rejected Shahu's claim to the throne . It is to be noted that Tarabai's deceased husband Rajaram had earlier claimed that he was ruling only as an representative of Shahu while the rightful king was being held in Mughal captivity. Despite Tarabai's rejection of his claim, a few Marathas joined Shahu, including Amritrao Kadam Bande, Sujan Singh Rawal, Nemaji Shinde, Bokil, and Purandare. Meanwhile Bahadur Shah, otherwise known as Muazzam, was crowned emperor of Delhi after superseding his brothers, Azam who was based at Ahmednagar and Kam Baksh who was at Hyderabad. Bahadur Shah (Shah Alam) maintained his distance from both Tarabai and Shahu and was noncommittal about Prince Azam's promise of sardeshmukhi to Shahu. A bitter battle for succession ensued between Shahu and Tarabai. Another contender was Sambhaji II, the other son of Rajaram from his queen, Rajasabai. Shahu's mother, Yesubai, remained imprisoned as insurance against Shahu's continued good behaviour until 1719 (Shahu's wife, Savitribai, and half-brother, Madansingh, also remained as hostages with the Mughals), until Maratha power strengthened, forcing the Mughals to release the queen mother unconditionally. Shahu succeeded to the Maratha throne (with Satara as his capital, in 1708) at the age of twenty six with the help of his aide, Balaji Vishwanath, who was an astute diplomat. Balaji Vishwanath managed to bring over many of Tarabai's aides to Shahu's side, including Dhanaji Jadhav (after the Battle of Khed in November 1707), forcing Tarabai to agree to a compromise. She accepted Shahu as the king of the Marathas and in return she was allowed to withdraw to a minor state of her own at Kolhapur from which she created an independent kingdom. In 1713, Kanhoji Angre, an ally of Tarabai, launched a swift attack on Satara, and was able to make Shahu's peshwa, Bahiroji Pingale, a prisoner. Shahu then made Balaji Vishwanath his peshwa. Balaji Vishwanth, then himself pursued Kanhoji Angre as far as Lohagad, his headquarters, and placed him in a precarious position. Balaji understood the importance of having a man such as Kanhoji Angre on his good side, so to this end, instead of demolishing his enemy, Balaji preferred to use diplomacy instead. In return for Angre accepting Shahu as his overlord, Angre was allowed to keep his territories and was also named the Maratha sarkhel (admiral). Fort Raigad was handed over to the mughals by its killedar Suryaji Pisal along with the queen Yesubai and the young prince Shahu, in return for the Sardeshmukhi of Wai. Years later, when Shahu returned, the first thing he did was to execute the traitor, Suryaji Pisal and many of his family members. Balaji even subdued other defiant Maratha sardars, such as Dhamaji Thorat, Krishnarao Khatavkar, Chandrasen Jadhav, Pant Pratinidhi, Santaji Jadhav and Udaji Chavan, and ensured the supremacy of his master. 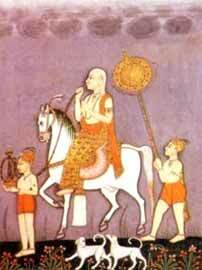 After Shahu's death the chatrapatis of Satara remained titular rulers only while the real power was wielded by the peshwas. Shahu was a good judge of character and a benevolent king. He was soon able to acquire the loyalty of many competent people (such as the Bhosales of Nagpur, the Holkars, the Shindes, the Gaekwads, etc), who saw to it that Maratha dominance reached its zenith during the reign of Shahu. Maratha dominance also extended beyond the boundaries of Maharashtra and into other western regions (Gujrat) and parts of central India (Madhya Pradesh and Jharkhand), and to the east (Orissa and Bengal), as well as northwards to Tamil Nadu and southwards to Karnataka. They ruled many provinces (Indore, Baroda, and Gwalior) in different parts of India, and also collected chauth (revenues) from many states. Though officially Shahu proclaimed his loyalty to the emperors of Delhi, it was a fact that the Mughal emperors themselves looked towards the Marathas for their preservation. The Marathas played a prominent role in installing and deposing emperors at Delhi. Shahu had four wives, and fathered two sons and four daughters. He adopted two sons, Fatehsinh I Bhonsle and later Rajaram II (grandson of his uncle, Rajaram) in 1745 (who succeeded him as the chatrapati at Satara).